Abb. 1: Kumulative Entwicklung der Tornado-Anzahl, nach Jahren aufgeschlüsselt. Graphik: NOAA. Wir sehen: Das Jahr 2018 war (zum Glück) nur Durchschnitt. Die Tornadoentwicklung der letzten 60 Jahre zeigt die Verhältnisse eindrücklich. In der Zeit 2005-2010 gab es eine Häufung der Tornados in den USA. Seitdem werden sie wieder seltener. Kein guter Stoff für Klimakatastrophengeschichten. Abb. 2: Anzahl der Tornados in den USA seit 1950. Quelle: NOAA. Angesichts der latenten Tornadogefahr fragte sich Hannes Stein 2013 in der Welt, weshalb die Amerikaner nicht nachhaltiger bauen, zum Beispiel Häuser aus Stein anstatt aus Holz. Eine schöne Visualisierung der globalen Winde gibt es übrigens auf ventusky.com. Meteorologists often use information about warm and cold fronts to determine whether a tornado will occur in a particular area. Now, a University of Missouri researcher has found that the temperature of the Pacific Ocean could help scientists predict the type and location of tornado activity in the U.S.
Laurel McCoy, an atmospheric science graduate student at the MU School of Natural Resources, and Tony Lupo, professor and chair of atmospheric science in the College of Agriculture, Food and Natural Resources, surveyed 56,457 tornado-like events from 1950 to 2011. 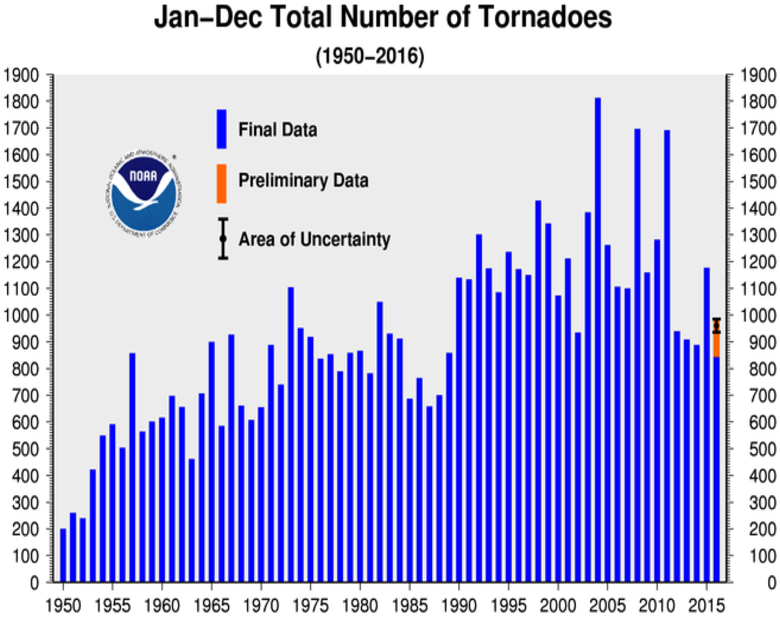 They found that when surface sea temperatures were warmer than average, the U.S. experienced 20.3 percent more tornados that were rated EF-2 to EF-5 on the Enhanced Fuijta (EF) scale. (The EF scale rates the strength of tornados based on the damage they cause. The scale has six category rankings from zero to five.). 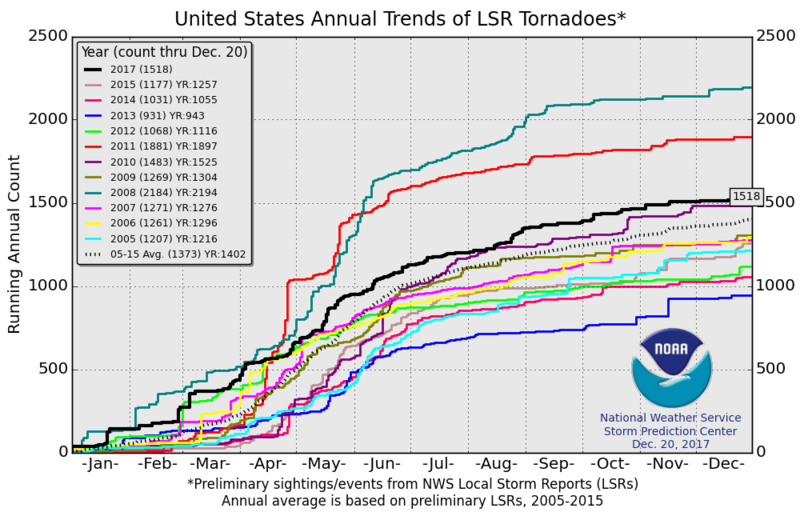 McCoy and Lupo found that the tornados that occurred when surface sea temperatures were above average were usually located to the west and north of tornado alley, an area in the Midwestern part of the U.S. that experiences more tornados than any other area. McCoy also found that when sea surface temperatures were cooler, more tornadoes tracked from southern states, like Alabama, into Tennessee, Illinois and Indiana. In 2011, more than 550 deaths occurred as a result of tornadoes, resulting in more than $28 billion in property damage, according to the U.S. National Oceanic and Atmospheric Administration. McCoy says that with her findings, officials may be able to save lives in the future. “Now that we know the effects of PDO cool and warm phases, weather forecasters have another tool to predict dangerous storms and inform the public of impending weather conditions,” McCoy said. Extended logistic regression is used to predict March–May severe convective storm (SCS) activity based on the preceding December–February (DJF) El Niño–Southern Oscillation (ENSO) state. The spatially resolved probabilistic forecasts are verified against U.S. tornado counts, hail events, and two environmental indices for severe convection. The cross-validated skill is positive for roughly a quarter of the U.S. Overall, indices are predicted with more skill than are storm reports, and hail events are predicted with more skill than tornado counts. Skill is higher in the cool phase of ENSO (La Niña like) when overall SCS activity is higher. SCS forecasts based on the predicted DJF ENSO state from coupled dynamical models initialized in October of the previous year extend the lead time with only a modest reduction in skill compared to forecasts based on the observed DJF ENSO state. Auch in Deutschland gibt es übrigens ab und zu Tornados. Einen Häufigkeitstrend für die letzten 15 Jahre gibt es allerdings nicht, wie man aus Abbildung 7 aus diesem DWD-Bericht ersehen kann.